Winter weather is finally starting to warm up across the country, and spring is almost here. On one hand, we can’t wait for warm weather. On the other, once the weather warms up we’re left to clean up the aftermath of all those winter storms. 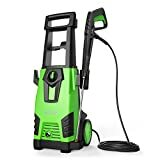 Head over to Amazon and you’ll find the deepest discount we’ve seen so far on the ROAV HydroClean Electric Pressure Washer by Anker. This 2100 PSI, 1.78 GPM power washer is worth every penny at $200, so $118 is definitely a can’t-miss deal! Intense Pressure: An 1800W motor pumps out 1.78 gpm to provide 2100 psi of pressure for a deep, thorough clean. Premium Design: Metal handles and spray gun ensure greater durability. 3 nozzles allow you to select the way you want to clean. Note: Make certain the nozzle is securely attached before turning on the pressure washer. Long Reach: Equipped with a 35 ft long cable and 26 ft long hoses to clean all around your porch, patio, driveway, or yard. Setup in Minutes: Just assemble the pressure washer, connect a hose, select a nozzle, and plug in to start cleaning right away. What’s in the Box: HydroClean pressure washer, 3 spray nozzles, high-pressure hose, detergent tank, spray gun, extender wand, 12-month worry-free warranty, and our friendly customer service.